Spirit Financial Credit Union: Helping a diverse community achieve personal financial growth - Times Publishing Newspapers, Inc.
By offering membership to anyone who lives, works, worships or attends school in Bucks County, Spirit Financial Credit Union (SFCU) focuses on spreading their vision of helping the diverse community to achieve personal financial growth throughout all stages of life. SFCU wants to be your trusted financial partner and help you achieve your financial goals. At SFCU, they are dedicated to building lifelong relationships with their members and to making a difference in the lives of the people they serve. Credit unions by nature are member-owned, not for profit financial institutions, and SFCU is no different. They will assist their clients with lower loan rates and higher deposit rates than banks. “We try to balance the value and convenience of modern banking with a personal touch of offering a neighborhood credit union,” says David. There’s always the ability to sign up for membership, make deposits, and check your account balance online – you can even apply for a loan on their website – but SFCU wants to keep that opportunity for in-person contact as a very present part of their place in the community. Their business was established in 1953 as Fairless Employees Credit Union, with a primary goal of helping the employees of the United States Steel Corporation. As they continued to grow, they became Fairless Credit Union in the 1980s, reflecting the credit union’s expanded legacy of serving the financial needs of various employee groups throughout the community. In 2005, their charter expanded again to include members of the Bucks County community. 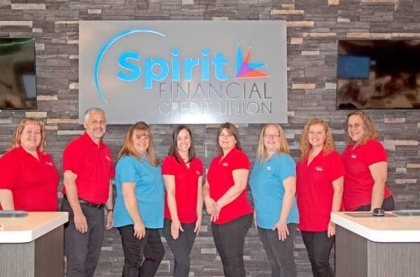 They became Spirit Financial Credit Union in 2016, to reflect their vision of helping the diverse community achieve that personal growth as mentioned before. They don’t focus on just one group of people, but offer their services to anyone who is part of the Bucks County community, as well as family members of an existing SFCU member. Other membership eligibilities include anyone who was originally employed with their original sponsor group U.S. Steel. “Spirit Financial Credit Union is a cooperative where we rely on our members to help each other,” David says. SFCU offers everything from personal loans, home equity and auto loans, credit cards, mortgages, money market accounts, checking and savings accounts, and much more. Learn more about them and what they can do to help you secure your financial growth as an individual on their website www.spiritfinancialcu.org. Their office is located at 8535 New Falls Road, Levittown. Contact them by phone at 267-580-0230. Their office hours are as follows: Monday through Wednesday, 8:30am to 4:30pm; Thursday, 8:30am to 5:00pm; Friday, 8:30am to 6:00pm; and Saturday, 9:00am to 12:00pm. PHOTO CAP: The staff at Spirit Financial Credit Untion, from left to right, Kristina Hammond, David Obarowski (CEO), Bernadette Checchia, Melanie Cobb, Sharon McCullough, Michelle Tirendi, Veronica Heizman. Missing from photo: Sarah Nagle.